Berthoud, CO - Announcing that Roe Hunting Resources, the developers of Elk Hunter’s Strategy App – Bowhunter’s Edition, has released a new powerful resource for iPhone, iPod touch, iPad, and Android users. This is an elk hunter’s dream come true, containing hundreds of different elk hunting scenarios and strategies to help elk hunters increase their chances of success. It takes only mere moments for hunters to select the scenario they are dealing with, learn why an elk is behaving the way it is, and choose from a variety of tactics and calls that will give the hunter the best chance for success in their situation. 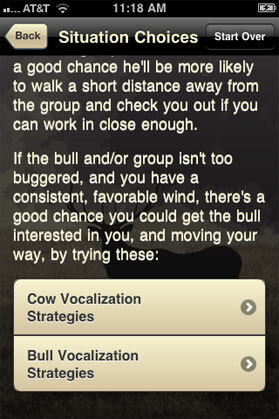 Elk Hunter’s Strategy App – Bowhunter’s Edition – is the best friend of any bowhunter who goes after elk. The application is a compilation of literally hundreds of different scenarios that elk hunters might find themselves in. All a hunter has to do is consult the appropriate situation to instantly discover which strategies and calls to use. Roe Hunting Resources provides online hunting resources, including instructional videos, forums, webinars and more. The company’s video blog, The Sweet Feed, gives folks updates, field conditions, breaking news, on-the-spot product and gear commentaries, hunting reports and more to help hunters succeed. Elk Hunter’s Strategy App is only $9.95 (USD) through the Android Market or $9.95 (USD) through the App Store in the Sports category. Promo codes for Apple devices are available for qualified reviewers; reimbursements are available for Android reviewers. Please specify the website or blog you represent when making your request.